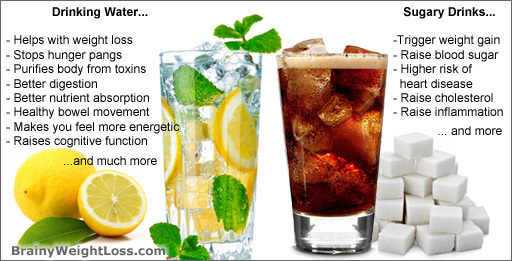 Water vs Coke Comparison: Should You Drink Water To Lose Weight? What do you drink when trying to get your extra weight off? 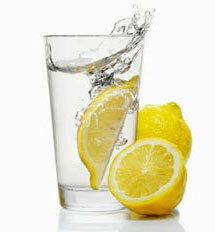 Do you drink water to lose weight? Or are you reaching for those “diet” fizzy drinks? Make sure you teach your kids know about this too, you’ll be glad you did! If you absolutely must have a carbonated drink, try sparkling mineral water with a squirt of lemon; lemon is a known aid in weight loss: it detoxifies your liver, balances your blood sugar and helps in digestion. Add some ice and fresh mint for a deliciously refreshing flavor. As you can see, you’ll want to drink water to lose weight. Next time when you reach for a Coke, you may want to remember this water vs Coke info. Phosphoric acid, one of the main ingredients in Coke and other soft drinks, has an acidic pH of 2.8; it will dissolve a nail in about 4 days. Compare this with water’s pH of 7 (keep in mind that the normal pH value of the body’s fluids range between 6.0 and 7.4). It is well-known that acidity in the body causes a plethora of health issues and is responsible for massive resistance to burn fat. The phosphoric acid in Coke leaches calcium from bones and teeth; the regular consumption of Coke and other colas contributes in a big way to the increase in premature tooth decay and osteoporosis. A 12 oz can of Coke has 150 calories: 100% carbs (40g) from insulin-spiking sugar. For the same caloric amount you can have a healthy, nutrient-dense snack, like 3/4 cup of edamame, or 50g hummus with 10 baby carrots, or 1 cup of oat bran with low-fat milk and a sliced raw peach, or even a 1/2 whole-wheat English muffin with a tablespoon of fruit spread. The sugar content in a can of Coke? The equivalent of 10 teaspoons! It’s not even sugar, but a hazardous substance for your health, high-fructose corn syrup. Among other nasty things that it does to your body, high-fructose corn syrup interferes with the metabolism of leptin, a hormone that’s supposed to make you feel satiated after you reach your caloric needs during a meal. But with a faulty leptin metabolism you continue to eat way beyond the satiation point, until the stomach’s distention sends signals that it’s full – and that’s always too much. According to an independent study published in the British medical journal The Lancet, there’s a strong link between soft drinks consumption and childhood obesity. They found that 12-year-olds who drank soft drinks regularly were more likely to be overweight than those who didn’t: for each additional soft drink consumed during the 2-year study, the risk of obesity increased with 60%. And don’t think that diet drinks are healthier; these are sweetened with aspartame, which according to Dr. Mercola, increases your appetite and carb cravings, worsens insulin sensitivity, stimulate fat storage causing greater weight gain than sugar, among many other negative effects. In fact, there are over 92 different health dangers associated with aspartame consumption, including brain damage, birth defects, diabetes, emotional disorders, a 50% increased risk of obesity, etc. In another shocking news, Reuters reported in March 2010 the results of a Danish study confirming that drinking over 32 oz of Coke daily may reduce sperm count in men by nearly 30%. Urban Legends, or More Disturbing Coke vs Water Facts You Didn’t Know? As you can see, the regular consumption of coke and other sweet drinks is one of the leading causes fueling the world-wide obesity epidemic. 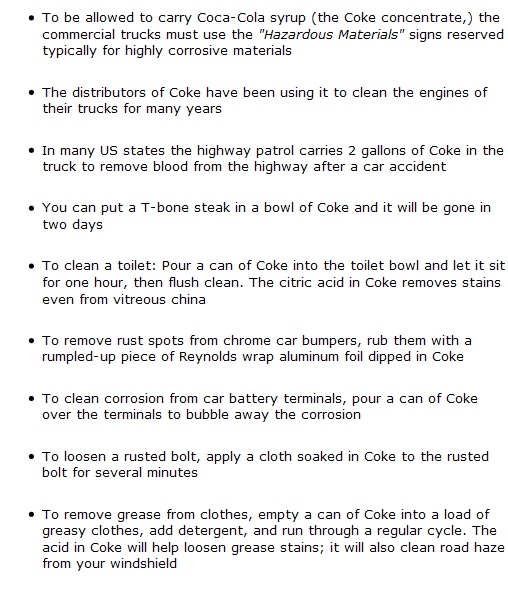 After reading this water vs Coke eye-opening info, the question is, would you like a glass of water or Coke? You choose.